What are the Five Biggest Obstacles in Granting Autonomy To Jammu and Kashmir? Can Jammu and Kashmir be granted autonomy which will end the decades-old Kashmir conflict? Former J&K CM Farooq Abdullah urged India and Pakistan to start a sustained dialogue and advocated an Ireland-type settlement to resolve the Kashmir dispute. 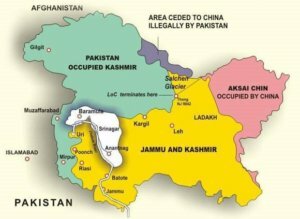 EurAsian Times analyses how feasible is granting autonomy to Jammu and Kashmir. What Did Farooq Abdullah Say? Farooq Abdullah urged the governments of India and Pakistan to start a sustained dialogue and pushed for an Ireland-type settlement model to resolve the decades-old Kashmir issue,” an NC spokesman said. Abdullah urged the Modi Government to restore autonomy to Jammu and Kashmir at the earliest. “Autonomy is the only way ahead to address the political and developmental issues of Jammu and Kashmir. It will ensure the secular fabric of our state and restore the bonds of amity and brotherhood,” he said. “We should not feel disheartened. The present situation in Kashmir is very gloomy, but we have seen the worst throughout history. At one time, people would not believe that the autocratic rule will end. But a day came when democratic forces usurped the Kings’ throne with resolution and struggle,” he concluded. However, netizens from Kashmir itself have heavily criticized Abdullah for playing a double game in Kashmir. When out of power, he demands autonomy and when in-power, he promotes the Indian cause, claim the netizens. As per the experts that EurAsian Times interviewed, Kashmir dispute cannot be resolved until and unless Pakistan is also involved. But Pakistan, due to its policies, has been sponsoring terrorism in India and Indian Home Minister Rajnath Sigh has stated clearly: “Terrorism and Talks Cannot Go Hand-in-Hand”. India and Pakistan may engage in serious peace process and negotiations by end of 2019 when the Indian general elections are over. Secondly, when we compare India with Pakistan in 2018, both nations are strikingly different. One one hand, Islamabad is in a deep financial debt and facing a massive economic crisis, while India continues to be the worlds fastest growing economy. India has gradually emerged as the worlds economic powerhouse, while a small nation like Bangladesh has surpassed Pakistan in economic growth rate and human development index. India is light years ahead of Pakistan. Pakistan is not in a position to negotiate with India on an equal footing and does not really expect India to make concessions on any matter, including Kashmir. The Kashmir issue may get resolved automatically when Islamabad becomes bankrupt and eventually decides to spend money to save Pakistan rather than saving Kashmir. Thirdly, granting autonomy might sound an interesting option to Farooq and Omar Abdullah right now when they are not in power. Abdullah knows and understands that an independent Kashmir may become a breeding ground for radicals and pro-India politicians like himself might be the first ones to be booted out from Kashmir. This will only result in a bloody civil war just like Syria or Iraq. Violent mobs plus terrorists will create havoc in the valley and do an irreversible damage to the situation and New Delhi will never let that happen. Fourthly, what people do not understand that both India and Pakistan have somewhat agreed to the fact that there will be no redrawing of the boundaries and independence is not an option on the table for Kashmir. Regions like Jammu and Ladakh will never want to unlink themselves with India and have supported the trifurcation of the state. The minority community in Kashmir will also not support Kashmiri Sunni Muslims for their quest of an Islamic caliphate (including Kashmiri Pandits, Sikhs and Shia’s – who vehemently oppose Pakistan). There is hardly any influence of “Azadi” in Gujjar-Bakarwal community of Kashmir who live very close to the border areas with Pakistan. Lastly, don’t forget, if India has to grant autonomy or freedom to Kashmir, then Pakistan will also have to reciprocate by granting autonomy/freedom to Gilgit-Baltistan (GB) and other occupied regions where Chinese CPEC project is passing through (worth approximately $60 Billion USD). What will Islamabad do in case the new autonomous GB government decides to block the CPEC project? Clearly, Pakistan will not put their country at stake for the Kashmir cause and both India and Pakistan will prefer to stick to the status quo.